A fantastic round for those wanting to get the most out of their .22LR’s without having to pay too much. 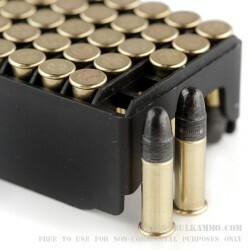 This is made by the SK Ammunition Company that is a sister company to powerhouse brands like Lapua and Berger Bullets, as well as VihtaVuori Powder; all subsidiaries under the Nammo brand umbrella. This is a serious brand and a serious line of ammunition that performs exceptionally well for a value priced round that you cannot match generally from the usual suspects, given this price point. 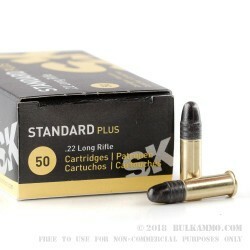 The SK Standard Plus is a bit heavy on the lubricant the rounds come covered in a very light oil, which makes them a bit annoying to handle but which helps protect against nicks, scratches and corrosion which maintains the consistency and accuracy of the cartridges. These are excellent match grade rounds for bargain basement prices. 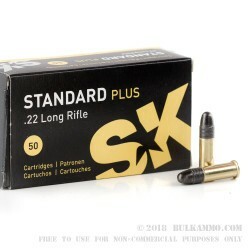 In any bolt action, single shot or revolver or most semi-auto firearms you will not be disappointed in the performance of the SK Standard Plus. 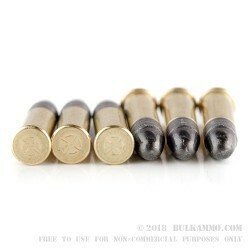 The 40 grain projectile is a solid lead round nosed bullet that is loaded into a brass rimfire primed casing. The OAL of the cartridges and the total weight of each round is exceptionally consistent in keeping with the “match grade” build standards. Q: What is the FPS of this. Posted On: 1/7/17 By: J. C.
A: Hello J.C. The muzzle velocity of this round per the manufacturer is 1050 fps. A: Hello Daniel, The velocity on this is listed at 1050 fps.